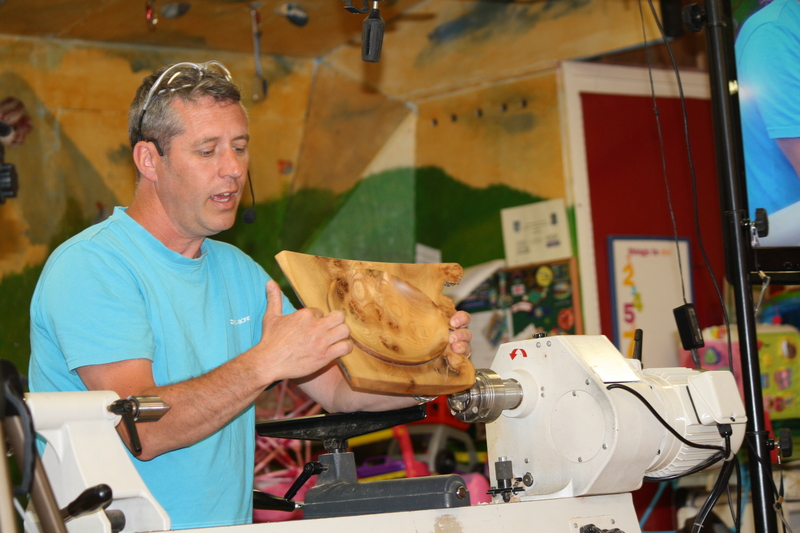 Once again, we had the services of Kieran Reynolds as our guest demonstrator for our June meet and Kieran picked up where he left off from the last time we had his skilled display. Again, he was showing us how to get the best out of wood we might discard as unusable and here he demonstrated how a keen eye can spot an artistic piece in a split, wane edged, or otherwise damaged blank. 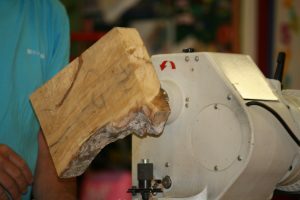 The first such piece Kieran mounted on the lathe with a screw chuck, was a blank of spalted beech around 280mm x 170mm x 50mm thick and had a few, what would be considered faults, like a bark edge and a split or two. From this he intended to turn a shallow bowl and the first thing he did was to mark, with the tailstock. 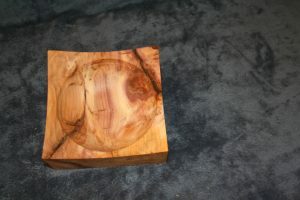 a centre point, to be used later to reposition the piece so as to remove the spigot he was about to cut. 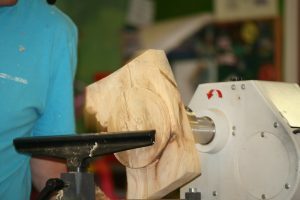 Having cut the spigot Kieran proceeded to shape the bottom, tapering it upwards towards the wings of the blank by about 8mm to create the illusion of the finished piece floating on the table. This done, the piece was reversed on the lathe and first marking a circle to get the maximum width, Kieran hollowed it out turning what appeared to be a useless piece of wood into an attractive and artistic looking bowl. After the break Kieran brought out a blank of yew around 260mm x 260 and about 70mm thick and setting it on the lathe as before, hollowed out the centre to make a square, quiet chunky looking bowl which I liked a lot. 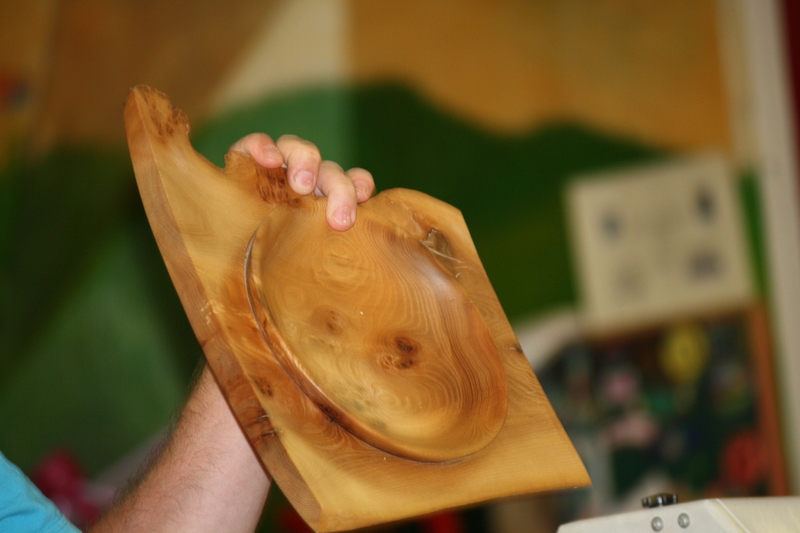 A discussion on finishes followed, Kieran showed his preference for Woodoc with some prefinished bowls he had brought with him, it does give a lovely silky finish. 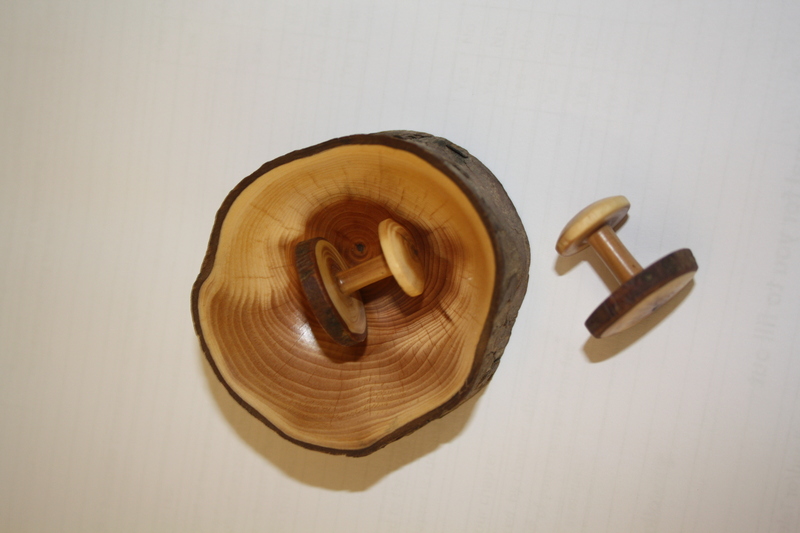 Kieran ended the day with a story of how he came to make a pair of wooden cuff links, then went on to show us how, from some branch wood, looked good, might try it myself. Thank you very much Kieran, for your well delivered demonstration, I know from the feedback how it was enjoyed by all, we look forward to seeing you again. 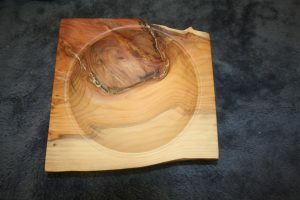 Chris Hayes took the 1st place in our monthly competition, Tom Gibson 2nd and Pat Gannon 3rd, we could sure do with some more entries, I believe next month’s subject is a goblet with captive ring, let’s see some of your work guys. That’s it for now, until next meeting work safe.